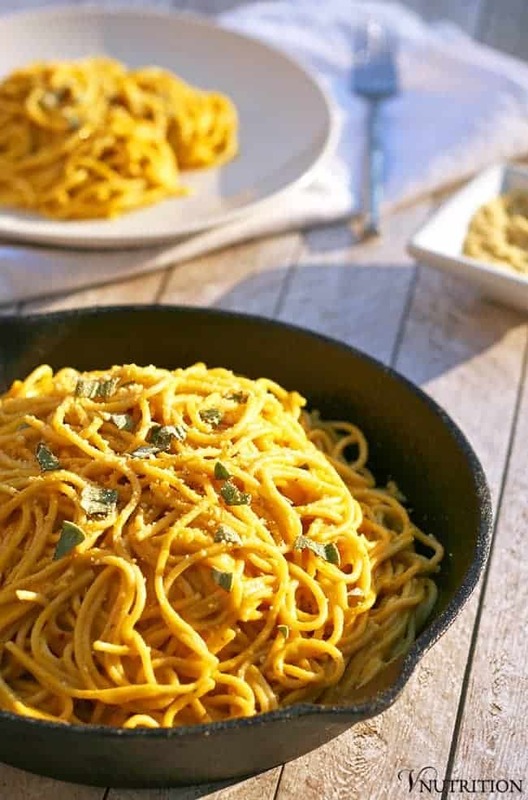 This creamy Vegan Pumpkin Pasta is perfect for fall. 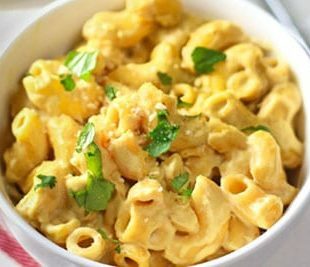 The sauce highlights the deliciousness of pumpkin & is rich and creamy (without the dairy). This hearty pasta will be a hit at dinner time! From some of my other recipes (like my Lemon One Pot Pasta and Cashew Mac & Cheese ) you might have realized I love pasta… but once fall hits I’m also a pumpkin freak. I figured why not combine my two loves for the perfect fall dish? So that’s what I did and the end result is a tasty and creamy vegan pumpkin pasta! I wanted to make this sauce as rich as one that contained dairy (but without using the dairy) so one of my favorite ingredients came into play – coconut milk. This time, however, I didn’t use the whole can of coconut milk. Side Note: Did you know that if you cool a can of coconut milk the creamy fat part will sink to the bottom and harden? If so you’re an awesome coconut fan like me and if you didn’t, now you’re a coconut pro too! I scooped out the hard coconut and used that part to keep the vegan pumpkin pasta sauce thick yet creamy. I know low fat is all the rage right now but unless you have a specific condition where fat is not allowed, you don’t need to be scared of healthy fat like in coconut. It’s totally good for us and keeps us full. I love the flavors of pumpkin and sage together. The sage adds a nice depth to the vegan pumpkin pasta sauce. I feel like it elevates the sauce and makes it “elegant”. It would be perfect to make for a fall/winter dinner party. I added a pinch of red pepper flakes as well- don’t worry my non-spicy-loving-friends, the sauce itself is not spicy but the pinch of pepper pushes it over the edge into amazing! Looking for something more kid-friendly? 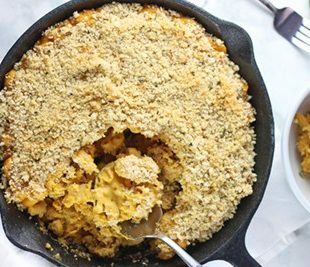 Check out my Pumpkin Mac and Cheese! Want to use up any extra sauce? Leftover sauce can be used to make my Pumpkin Casserole! This pasta is loaded with beta-carotene from the pumpkin. Beta-carotene can be converted to Vitamin A in our bodies and aids in vision health as well as a healthy immune system. The sauce contains a nice serving of fat from the coconut milk – and like I said above don’t be scared of good fats our brain needs fat! Serve this vegan pumpkin pasta with a big green salad topped with a nice handful of nuts and you should be good to go nutrition-wise for dinner. Don’t forget to top this tasty dish with my parmesan cheese alternative! It adds that extra hint of cheesy flavor. I hope you enjoy my simple vegan Pumpkin Pasta. If you make this recipe, let me know what you think by ★ star rating it and leaving a comment below. Place coconut milk upside down in freezer while making the rest of the meal. While pasta is cooking, heat olive oil in large saucepan. Open coconut milk and scoop out the hardened top part and add that along with vinegar and nutritional yeast to pan (do not add watery part of coconut milk) and stir. Bring the sauce to a boil then turn heat to low and simmer for 5 minutes. Top with more sage leaves and my vegan parmesan (link to recipe below). *This recipe makes 2 cups of sauce which should make more sauce than needed for a box of pasta. What a pretty pasta dish!! Since I can’t really have pumpkin, I may try to do a sweet potato or butternut squash purée instead. It sounds just lovely Mary Ellen! Thanks Kimmy! I don’t have many more pumpkin recipes to post – maybe 2 but I do have a butternut squash recipe coming for you! I am eating it now and its really good, it would be fantastic with sweet potato or butternut squash if you don’t want the strong sweet potato flavour! I’ve got some pasta in my pantry that I was planning on cooking with a pumpkin sauce. You’ve saved me from looking for a recipe! Glad to help Diane!! Let me know what you think! This sounds so perfect for the cooler weather and the creaminess is very impressive! Thanks so much Kari! I love creamy food – just without the cream! Yum! I love anything with coconut milk and pumpkin! Yum, this looks delicious and I gotta try it with soybean protein spaghetti – yum. Thanks! Let me know how it is with the bean pasta Christine! No. 12 in ingredient list “Add the hardened” ??? Sorry Maraika, I fixed that! Oo. 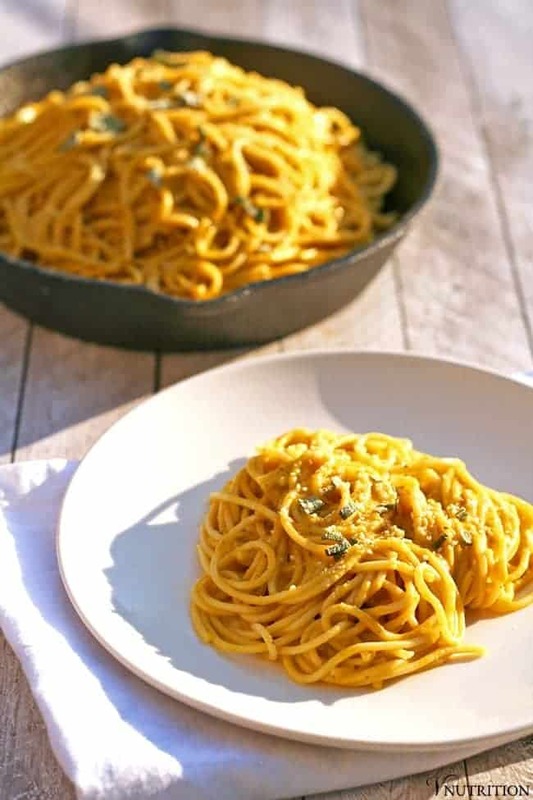 You know, I’ve tried other pumpkin pastas and never really cared for them, but your addition of coconut milk and sage makes me really want to try this! Plus, I trust your judgment lol. Thanks for sharing! I hope my pasta lives up to your expectations – I really hope you like it! If you try it let me know what you think! Have a great weekend Randi! 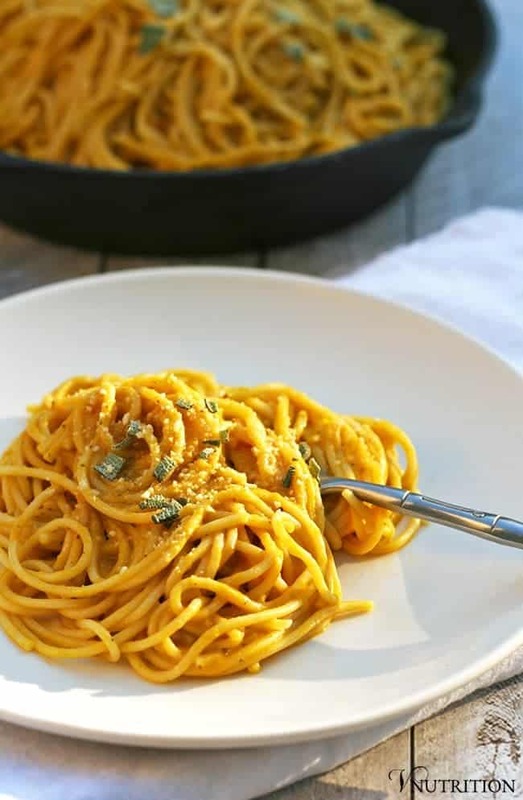 Mary Ellen, this is truly a fantastic recipe I love the way the pumpkin sauce coats and flavours the pasta – I may have to up the hot pepper flakes a little though, hope you don’t mind – licking my lips though! Thank you Shaheen! <3 I don't blame you for upping the pepper flakes, I love spicy too! I just found your website today from a post that “Fried Dandelions” put on facebook. Just made this recipe, it’s so easy and delicious! My only changes were dried sage instead of fresh and not blending the sauce at the end, I thought it was creamy enough. It’s so creamy and rich and tasty. Thank you! How unusual and beautiful. This sounds so interesting I just have to try it. Thanks so much Ginny! Thanks so sweet! Let me know if you try it! It is a well documented fact that the hard orange vegetables (pumpkin, butternut squash, etc) and sage are a natural. Your taste is right on point. The dish looks spectacular and I love the addition of coconut milk. Thank you so much Zsu, I appreciate it! I’m glad my taste buds are leading me in the right direction! I LOVE the combo of sage and pumpkin! So yummy and perfect for fall! Thanks Annmarie! I love fall meals! I made a pumpkin alfredo pasta bake the other day and the whole family loved it. Now, I’ll have to try this version too! Looks so creamy and delicious! Oooh the pasta bake sounds good! Let me know if you try this version! 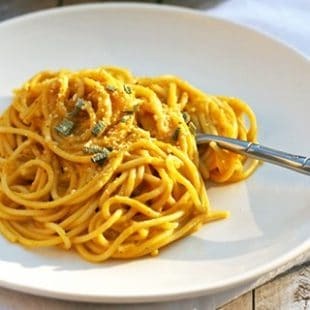 I love the idea of the coconut milk and pumpkin in a pasta sauce! And thanks for the tip about cooling the can so the harder bit sinks to the bottom. I’ll definitely be trying that! Thanks Corina! I’m glad you like the tip! Let me know if you try the pasta! Ooh I love pumpkin I imagine you can swap the pumpkin out for sweet potatoe too. Can´t wait to try it this evening. Yes, I think sweet potato would also work well. Thanks so much for stopping by Will. Let me know if you try it! I’ve never tried pumpkin pasta before, but I love both pumpkin and pasta. The dish looks so good, creamy and healthy as well, and the pics are gorgeous. Gonna give it a try. So glad you enjoyed it, Christoph! We made this sauce exactly as written and used it to top our homemade vegan pumpkin filled ravioli as a test for a possible first course for Thanksgiving. It was delicious. We are definitely making this for Thanksgiving and I imagine for many other meals as well. Very creamy and delicious. Thank you for this recipe. Your homemade vegan pumpkin filled ravioli sounds delicious! Yum! We originally tried the Sage Butter Sauce included in this recipe, but did not like it. I did some searching and found your recipe and I think it is the perfect compliment to the pumpkin filled ravioli. Thanks again. Omg This is sooooo good! Every morsel is delectable it’s comfort food. This is my first cream pumpkin pasta sauce I made and Vegan at that. Like someone mentioned I didn’t blend it either, not necessary. Very simple ingredients yet packed with flavour. I saved other cream pumpkin sauce recipes from pinterest,, but needless to say this is the only one I’m making. I am so happy you enjoyed it Mina! Your comment made my day! That’s true, I enjoy the sauce even without blending it sometimes too. Hi this recipe looks amazing. Unfortunately I can’t eat coconut. Any suggestion for an alternative? Cashew possibly? Hi Samantha! I haven’t tried it with cashew cream but it’s delicious so it could work. I use it in this casserole and people tend to really like it: https://www.vnutritionandwellness.com/vegetable-bean-casserole-4. I think maybe use a little bit more water because cashew cream can get a little thicker. If you do get to try, please let me know how it works. Btw I’m making this for your Vegetable Pumpkin Casserole hence the suggestion for quinoa. Thanks! Samantha, I have never tried quinoa as a breadcrumb replacement but I like the idea. So long as the quinoa is cooked, it could be a good option. Again, if you do get to try it, let me know how it turns out! I hope it works! Oh yeah, mixing it in sounds good! I make this recipe with a variety of bases, but a similar mix of ingredients. Yours is really inspired!